Happy Wednesday everyone. I'm sorry to have just disappeared last week but I needed a mental vacation to prepare for the end of summer and heading back to school. My summer vacation officially ended yesterday but my kids still have about 2 weeks left of theirs. We've been having so much fun and going on so many mini vacations that the school year crept up on me and I was not entirely prepared. But everything is in order now and I'm glad to be back to blogging. 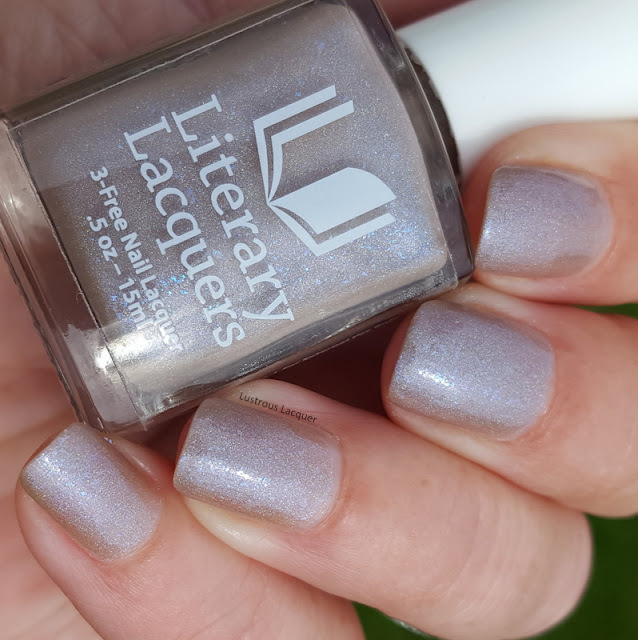 I'm kicking things off with 2 gorgeous polishes from Literary Lacquers. 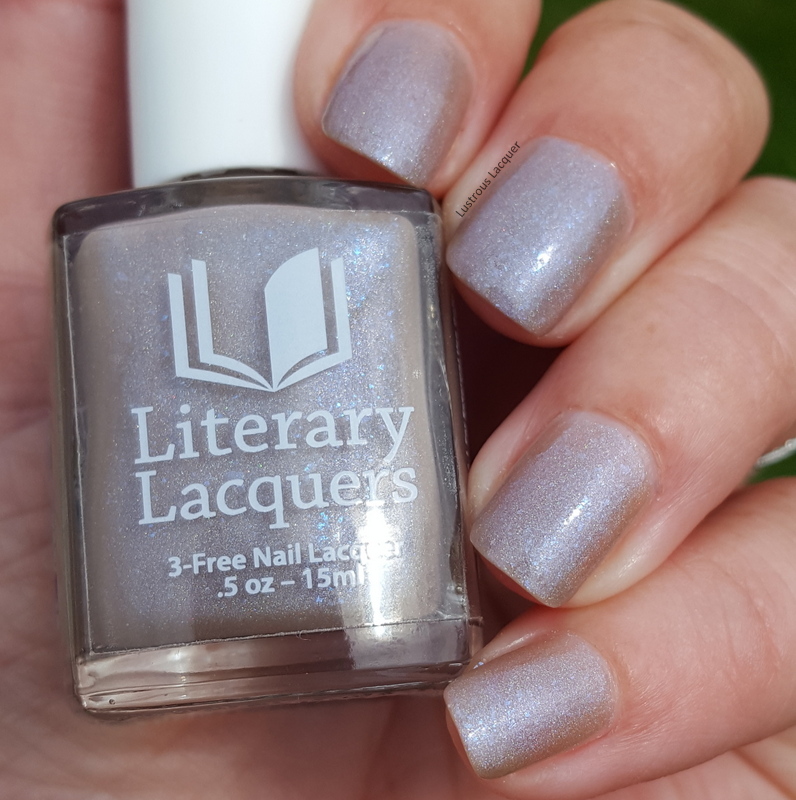 I have the Book Club polish and a special Birthday polish to share with you today. Both polishes are LE's but will be available for purchase starting tomorrow Aug 24th through Sept 8th. I'll have more details about the launch later on in the post but for right now let's get to the polish. The book club LE is Thousand Different Strokes of Light, a taupe polish with blue glass flecks and scattered holographic micro glitter. The formula for Thousand Different Strokes of Light is practically flawless. 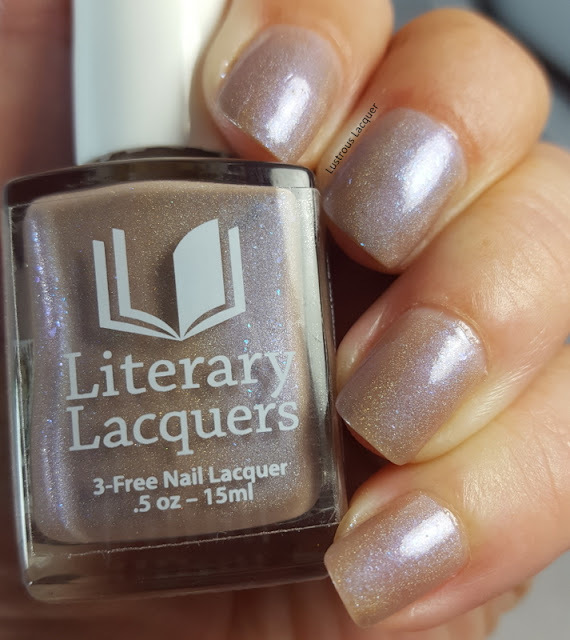 The polish flowed smoothly and evenly onto the nail. I had nice even coverage with the glass flecks with only a few wanting to stick over my finger tip. The first coat applied slightly sheer but builds up nicely. Shown here is 2 coats plus top coat. Sadly the glass flecks wanted to hide from my camera and I was only really able to capture them in the bottle but trust me they are more evident when looking at your nails. You can get a glimpse of them in my last macro shot just along the edge of the focal point. 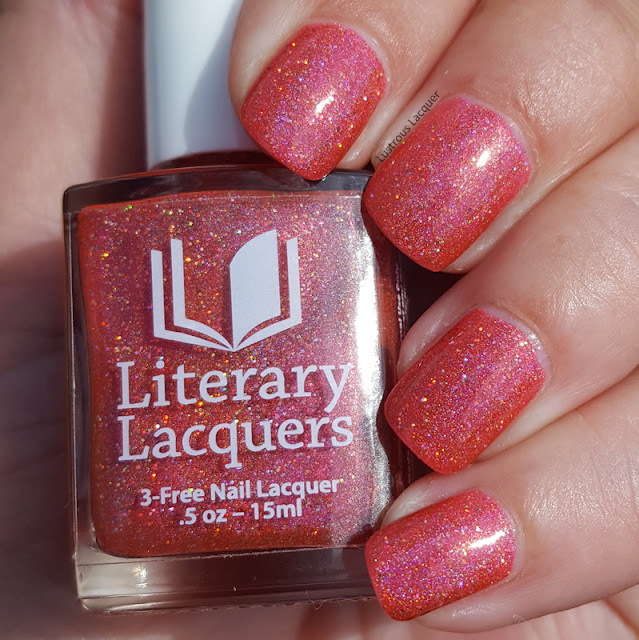 The Birthday LE is Unspeakably Desirable and these bottles will be numbered for those of you who like to collect LE polishes. 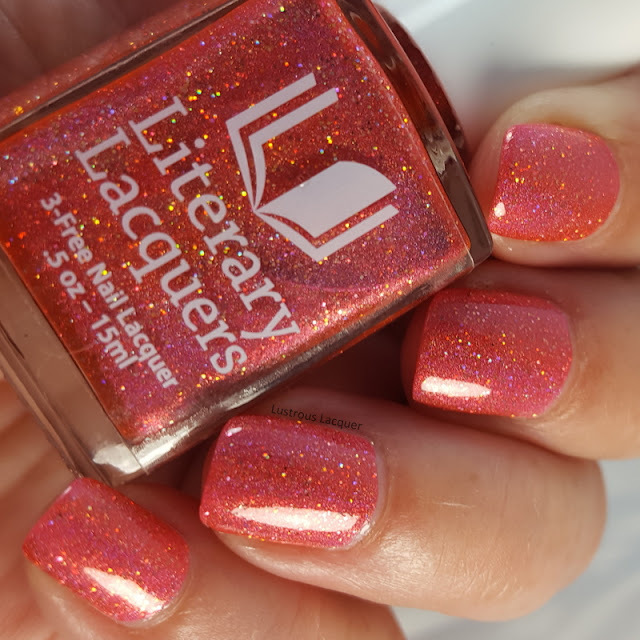 Unspeakably Desirable is a bright coral polish with scattered holographic glitters. The formula has a smooth application and complete control over where the polish went on the nail. The glitters do give this polish a bit of a grit to it when wet but that didn't affect how the polish applied at all. And there was no texture left once the polish dried. I had nice almost full opacity after 1 coat. Shown here is 2 coats plus top coat. 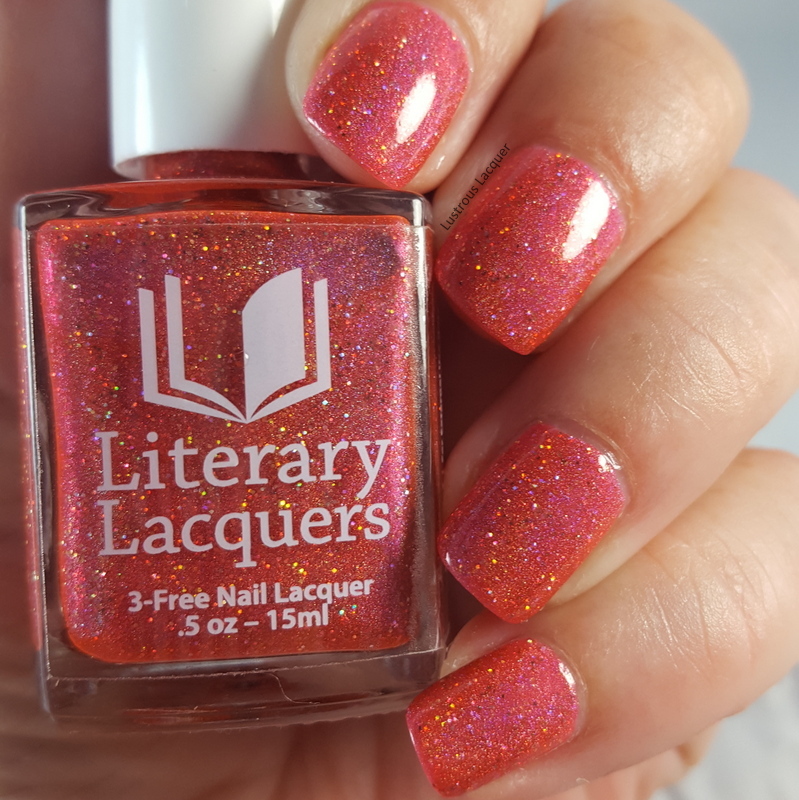 For me, this polish looked more orange in the bottle, during application it had more of a salmon color to it, but it dries to a nice coral pink. 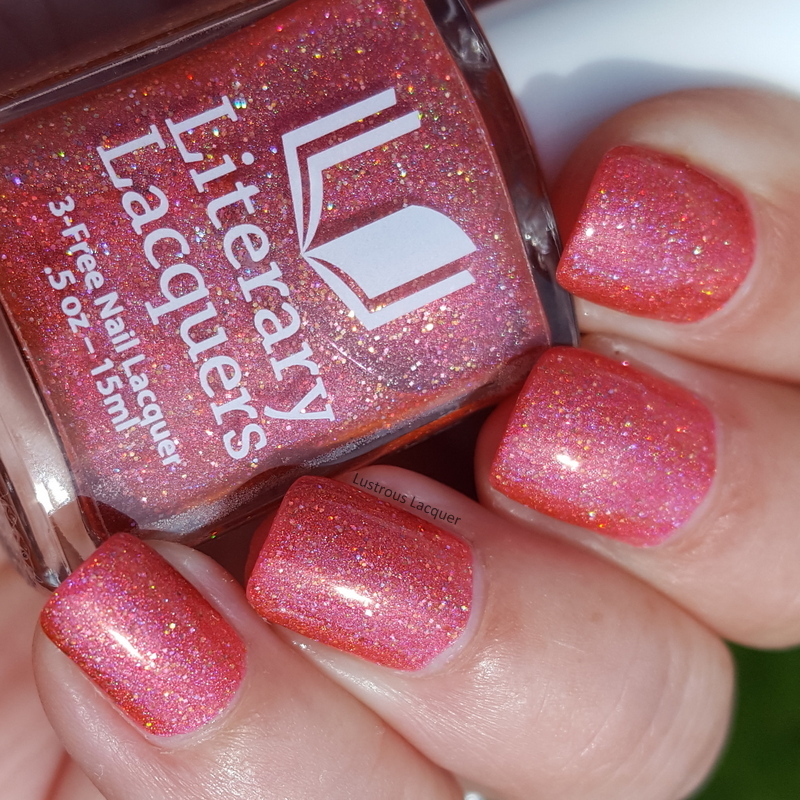 As mentioned above these polishes will be available on Aug 24th starting at noon mountain time. The LE's will be available for purchase through Sept 8th. 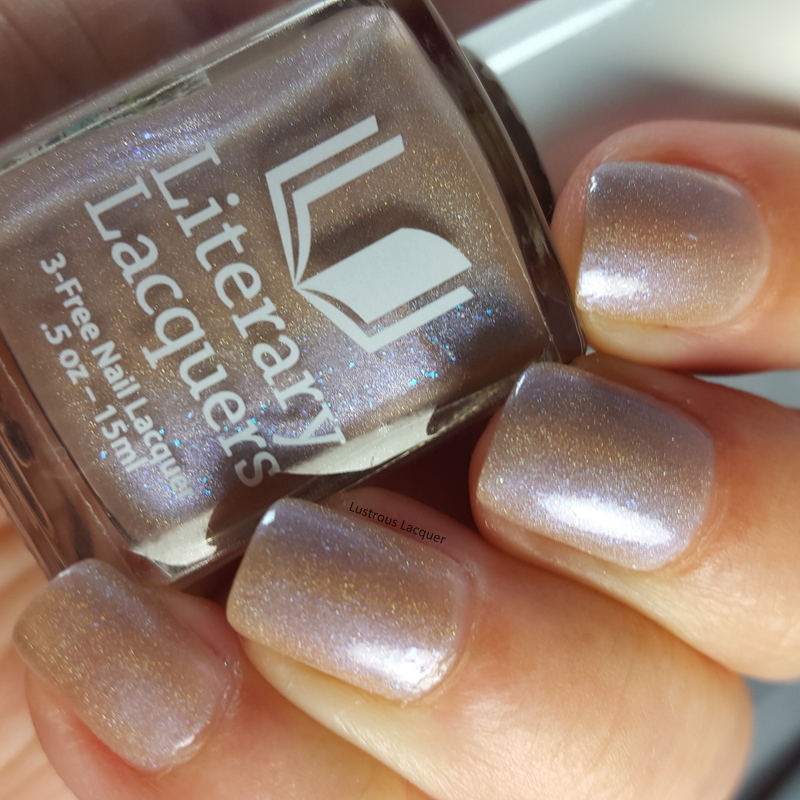 Holos and multichrome polishes will be $12. Glitters, Shimmers and, cremes will be $10.